According to the National Hydrology Meteorology Forecast Center, a tropical low pressure was weakened into the depression zone in the southeastern provinces from Binh Thuan to Ba Ria- Vung Tau with its strongest wind of under level 6 near the center. The tropical depression bringing long- lasting heavy rains and powerful wind of level 6- 8 yesterday caused floods in the south central provinces from Ninh Thuan to Ba Ria- Vung Tau . Many localities have been still isolated by the floodwater. With the complicated weather, the National Steering Committee for Flood and Storm Prevention, Search and Rescue in Ba Ria- Vung Tau required 3, 410 fishing boats and 17, 528 fishermen running out of damaged zone. Medium- heavy rains, thunderstorm, cyclone and powerful wind are forecast to continue impacting to Ninh Thuan, Binh Thuan, Dak Nong, Lam Dong and the southern provinces with its peak rainfall of 20- 70 mm in next couple days. The weather experts predicted that storms and tropical low pressures will continue hitting the country by the beginning of next year. Meanwhile, the national weather news from the National Hydrology Meteorology Forecast Center also reported that around four or six cold fronts begin moving to the northern and north central region starting November. Because the cold airs push the pressure trough ahead the southwards, it is expected to cause new tropical low pressures or storms in the country. At present, the southern region begins impacting by the powerful operation of the northeast monsoon. Vice Director of the National Hydrology Meteorology Forecast Center Le Thanh Hai said that the nationwide weather entered ENSO being complex weather between El Niño and La Niña, so rainy and typhoon season will end later than last years. As the related weather news about floodwaters and heavy rains, Deputy General Director of Irrigation Department under the Agriculture and Rural Development Mr. Tran Quang Hoai yesterday led a delegation from the National Steering Committee for Natural Disaster Prevention, Search and Rescue to start working with leaders of Khanh Hoa about the previous floods. 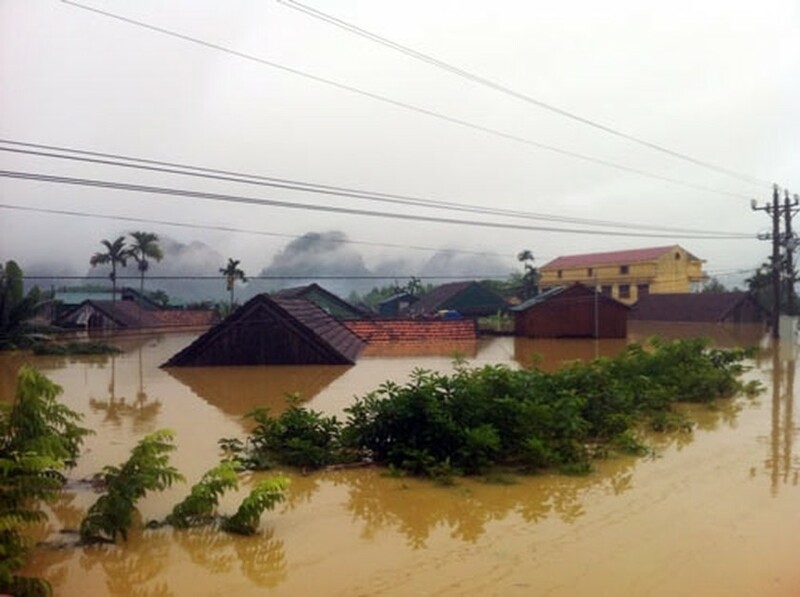 From November 2- 5, the province’s total rainfall reached at 250- 500 mm, even up to 730 mm in the Khanh Vinh mountainous district; and floodwaters raised rapidly in the local rivers above alarm level 3. The floodwaters and heavy rains destroyed 281 houses, 1, 700 rice hectares, 147 hectares of flower and vegetable crops, 41 kilometers of dyke system and 30, 000 meters cubic of landslide. In addition, seven fishing vessels were sunk. Total damage was estimated to reach VND 124 billion.